It’s MUCH less expensive than shopping retail. The selection is varied. While mall shops are typically filled with what’s trendy and in season, thrift stores offer a wide range of styles in everything from summer tank tops to winter coats. The items are more unique. Buy that interesting knickknack at the thrift store, and you’re probably the only person within 500 miles who has one. Reusing is far better than throwing away. It’s amazing how much perfectly good stuff gets dumped into landfills. Many thrift stores are run by charities. I like knowing my money will be used to help a homeless pet or a disabled person, not to line a corporation's pocket. There’s no packaging. Retail items are absurdly over-packaged. It’s wasteful and really annoying. I’m convinced clamshell packaging was invented by demons… who no doubt dance the Gleeful Demonic Jig as we injure ourselves trying to extract our purchases. I’ve found many great bargains while shopping secondhand. This desk was solid wood and very sturdy. It was missing the center drawer, but for me, this was good because it gave me more knee clearance for my long legs. The desk had only scratches and dings; no major defects on the wood. It was easy to beautify with some sanding and painting. I use it every day. This vacuum cleaner didn’t work because it needed a belt... but the previous owner had taped an unopened package of two belts to the vacuum. After installing the belt, I noticed the vacuum didn't have good suction. I took out the dust bag, poked around a bit, and removed a marker that was stuck in the tube. With 30 minutes of minor maintenance, my $3 vacuum cleaner worked fine. I’ve been using it for more than three years. What great secondhand finds have you made? A little while ago, a storm hit. It was POURING rain... and my house has no shingles and no tarp (which is very odd because the roofer specifically told me this morning that he was going out to buy a new tarp). Water was dripping from the light fixture in my kitchen ceiling. This is bad. There's a puddle of water in my garage. I'm guessing the only reason there are no puddles in my house is that the insulation in the attic soaked up the rain. There's water damage to the plywood over the garage... and probably to the plywood over the rest of the house. Why did the roofer not put a tarp over my house? All of this could have been avoided. I am livid. As soon as the roofer arrived this morning, I told him what had happened. To his credit, he responded with, "Don't worry, I'm here to take care of you." and immediately went to look at the problem. It turns out that only a small area of the garage had been left bare (just enough to cause a scary puddle to form... like the little pool of blood in a horror movie that indicates you're about to discover something really terrifying). The rest of the roof was fairly well protected with tar paper. The water in the kitchen had come in around a vent pipe. Luckily, the storm had been brief and the plywood over the garage dried rapidly, leaving no permanent damage. Inspection of the attic revealed dry, fluffy insulation throughout. WHEW! I am relieved but still grouchy about the situation. Why leave one section of the garage bare? And why not tarp the roof? (And while we're at it, why leave boxes of stuff on the roof that could (and did) get blown off by the wind (but fortunately didn't land on anything important).) The roofer admitted he should have tarped the roof and apologized for scaring me. ("As a homeowner, I can understand why you'd be concerned about water coming in." Damn right I'm concerned! Water dripping from a light fixture = bad.) He also made a point of telling me that if there were any damage, he'd make it right. In my experience, contractors don't admit when they've made a mistake, and they certainly don't say they'll make it right. A contractor with a hint of integrity is a rare thing. I guess this guy isn't so bad, and I refrained from punching, kicking or otherwise taking out my frustration on him. I don’t recommend using your iron to make grilled cheese sandwiches, but do keep an open mind about uses for things. Sometimes using an item for the “wrong” purpose is the perfect solution to an organizing problem. 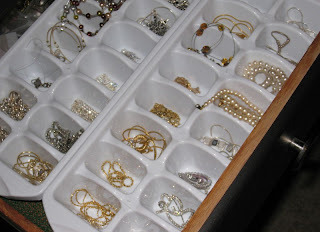 The intended purpose of ice trays is to make ice, but they also make excellent organizers for jewelry. They work especially well side-by-side in a shallow drawer, or you can stack them. Here's another jewelry storage idea. A mesh letter tray hung on the wall will hold a LOT of earrings. This one came from Dollar Tree and cost - you guessed it! - just $1. There are all kinds of shoe organizers on the market. Too bad they're less than useful for sizable goth footwear such as Demonia platform heels or New Rock boots. I use two sizes of wire stacking shelves for my shoes. ClosetMaid vertical organizers are perfect for boots. Perversely, I’ve used an IKEA shoe rack to hold towels because it was shallow enough to fit the small bathroom space. How about an Estee Lauder faux crocodile makeup bag...very posh. ;) I bought it new at a thrift store for $3. It makes a luxurious home for my spools of ribbon. What kinds of creative storage are you using? Tea, Witchery and Gothic Horror!